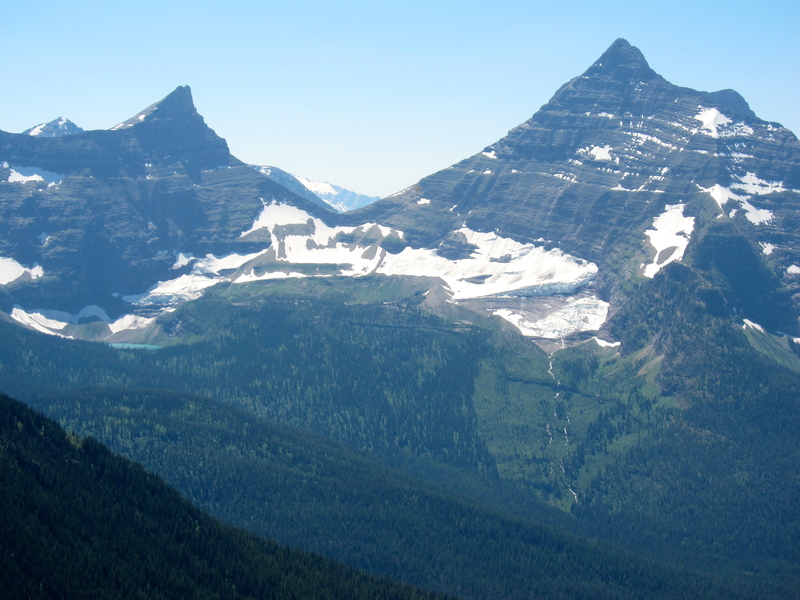 August.12.2015 August.12.2015 DaveC3 Comments on Thompson Creek Fire: What’s burning in Glacier? Thompson Creek Fire: What’s burning in Glacier? Looking down into the Nyack Valley from near Red Eagle Pass. Thompson Creek is the major drainage entering on the right. 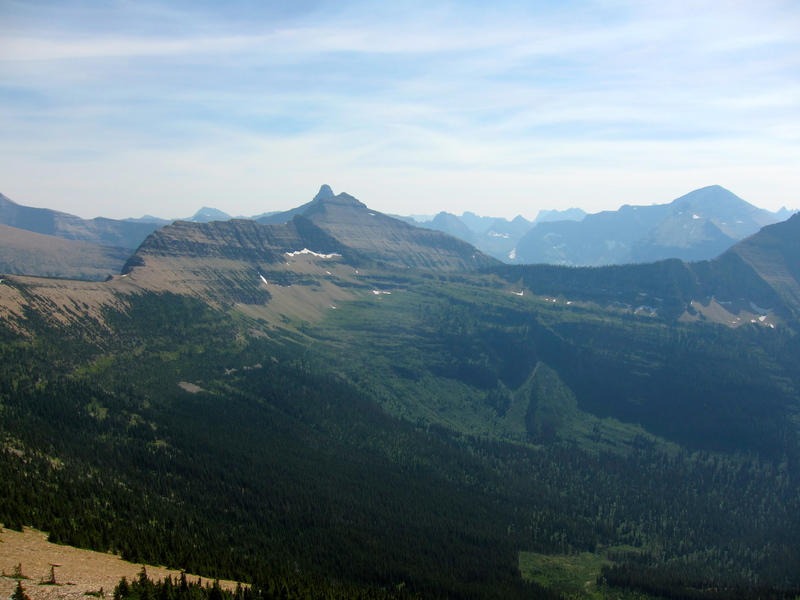 Yet another fire got started in Glacier NP over the weekend, and in the last few days of hot weather and strong winds has blow up exponentially. 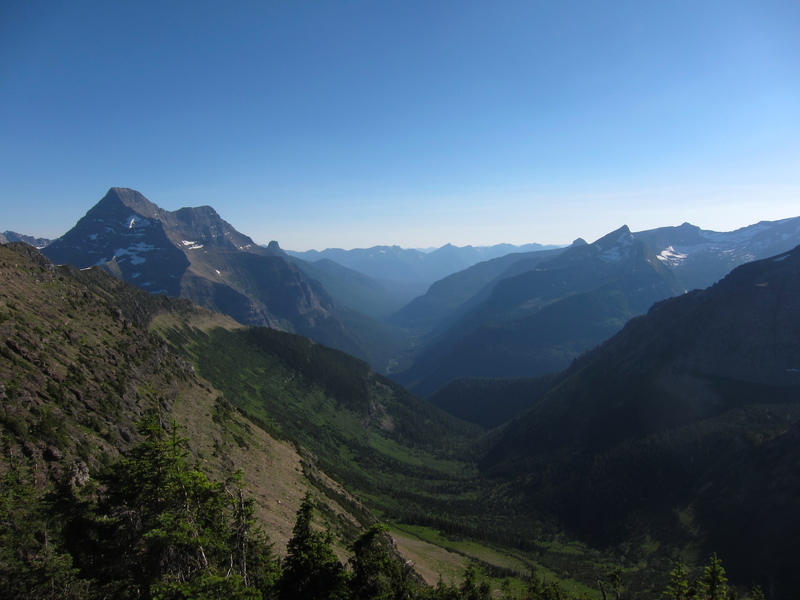 The Thompson Creek fire is already several times larger than the Reynolds Creek fire, but because it is in one of the least visited areas of the park, rather than right next to Going-to-the-Sun road, it promises less hysteria. Interestingly, this obscure corner was 90 years ago the main way across the park, and the second option in line when a road was built in the 1930s. The red dot denotes the probable starting location, and the fire has spread east along the slopes of Nyack Creek into all the immediately associated basins show above. The Upper Nyack campground and the nearby patrol cabin are most likely toast, along with vast tracts of oldish growth pine forest, subalpine forest, and plenty of slide alder hellholes. The preceding photo was taken from high on the ridge near Norris Mountain across the upper Nyack valley, and shows the northeast face of Mount Stimson, the most massive peak in the park. Make no mistake, those lighter green patches below the hanging snowfields may look like alpine meadows, but they’re actually alder and Devil’s Club jungles. You won’t find that unique biome much further east anywhere in North America. This photo was taken from the east shoulder of Razoredge and looks south across the basin towards McClintock. 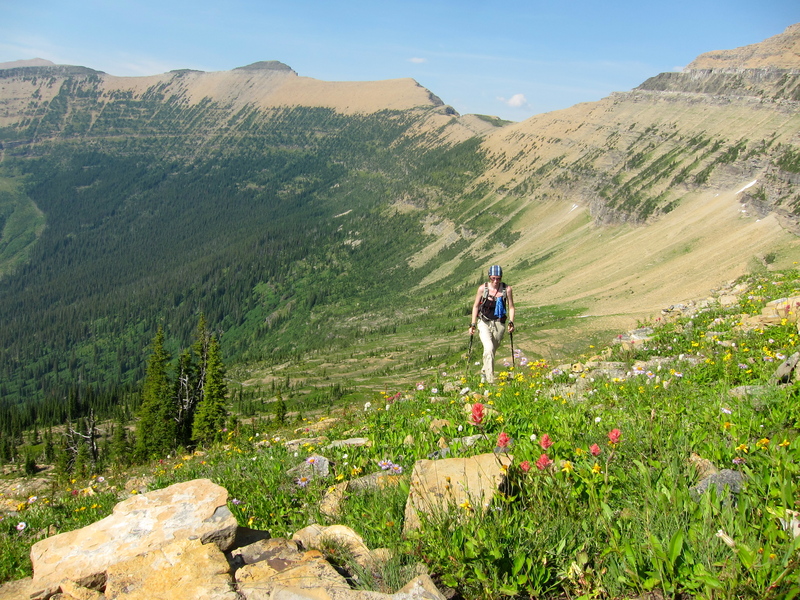 The Cutbank Pass trail descends the far wall, and later that day we saw a big group of bighorn rams in the meadow just left of center. All of the forest pictured is presumably on fire. Here’s the exact opposite view, looking back across the basin towards Razoredge, rams out of sight below. 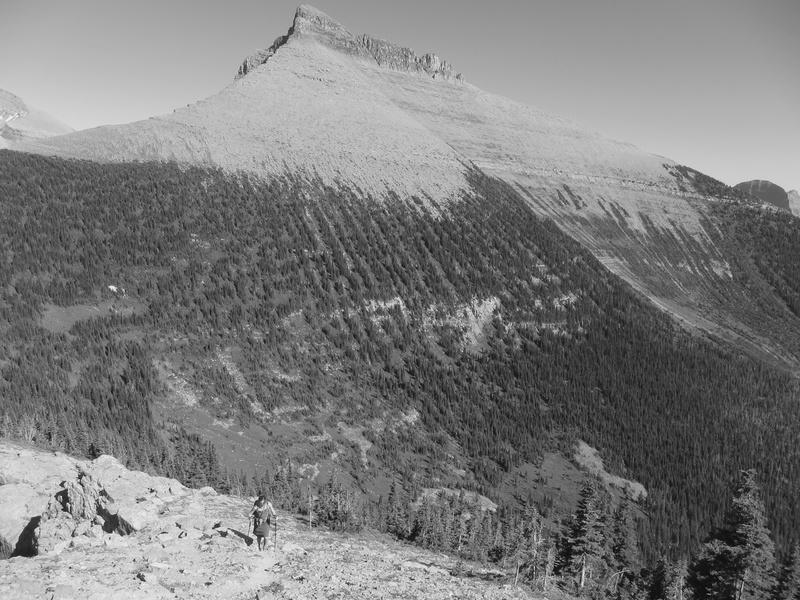 It may seem sad to have country like this go up in smoke, but these subalpine fingers and the robust, aged hands from which they come had simply reached their time. Older forests are meant to burn, and during record-settingly hot and dry summers like this one, lots of them do just that. It is inevitable. I’ll be curious to see how far up the wet flank of Norris the fire progresses. As can be seen from the avalanche stripes, alpine forests like these can grow on remarkably steep slopes. Even if they burn utterly the skeletons will remain well rooted, and stand against the snows of winter for many years. Flowers and forbes will come back, and quickly, as will the various herbivores. Pika will still find grass for haystacks, sheep and elk a source of fat for the winter, and a few hikers food for their eyes. Landscapes are engaging because they live paradox, being both immutable beyond the reach of our thoughts and drastically changeable within the life of one person. Fire is one of the more regular truly drastic architects of change in the landscape, and thus it’s presence is for the close observer simply exciting. Like a once in a decade winter storm I can’t wait to see what things will be like on the far side. I was unaware exactly where this fire was burning so thank you for the report. Although I lived in Coal/Nyack for multiple weeks a decade ago I never explored into the Thompson Creek area but am intimately familiar with the Nyack zone. I quite liked that cabin for one thing. Sounds like they managed to save the Upper Nyack cabin! Strategic bucket drops, wrapping the cabin, and a sprinkler set up seems to have worked. That’s great news, Ali. Thanks for pointing that out.